Submitted photo Guests of Scioto Foundation’s 2015 academic luncheon celebrating academia over a meal. The Scioto Foundation recently held its annual academic luncheon and honored over 250 students, donors, and parents, as they presented scholarships to over 80 students in attendance. For the 2015-16 academic year, the Scioto Foundation awarded $370,000 to students all over the region. 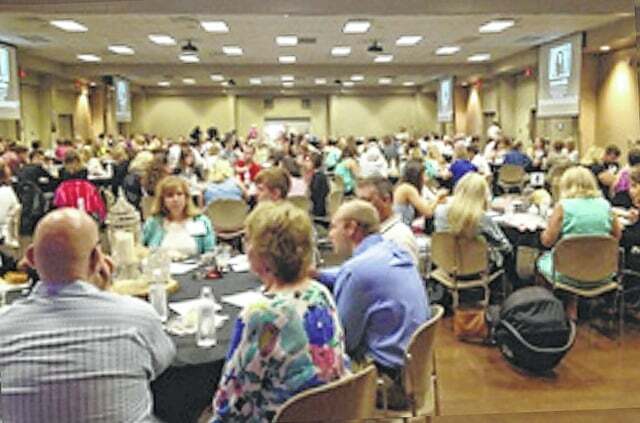 Executive Director Kim Cutlip said that the luncheon was a major success, along with the many scholarships awarded. Cutlip went on to say that the luncheon also provides a sense of identity to the scholarships, since donors get the opportunity to physically meet and discuss with the students, and get the opportunity to put a face to their cause. The Scioto Foundation has been assisting students to achieve their educational goals through scholarship opportunities since 1981. The luncheon has been ongoing for 15 of those years. The luncheon first happened by chance, when the organization was hosting a celebration of an anniversary with donors. The group invited some of their scholarship recipients and Cutlip said that everything just clicked with its success and the connections forged between the donors and students. Cutlip said that the amount of scholarships awarded this year was pretty typical for the organization and she looks forward to eventually reaching the major milestone of $500,000. Cutlip explained that the scholarships are all created with local dollars by local community members and go right back to the area students who are pursuing higher education. Local Portsmouth High School Graduate William Meriwether is now a senior at Miami University, where he has dedicated four years to studying music. He has received many scholarships from the organization over the years and says that he wouldn’t be where he is today without the Foundation’s support. Meriwether went on to say that the luncheons and the scholarship opportunities have given him more than a financial support for his future, but relationships he will never forget. The Scioto Foundation plans on another celebration of scholarship next July and will be working to secure more funds for students in the meantime. “These donors are helping make dreams come true for these students, so we think it is a really wonderful cause,” Cutlip said. Reach Joseph Pratt at 740-353-3101, ext. 1932, or by Twitter @JosephPrat03.